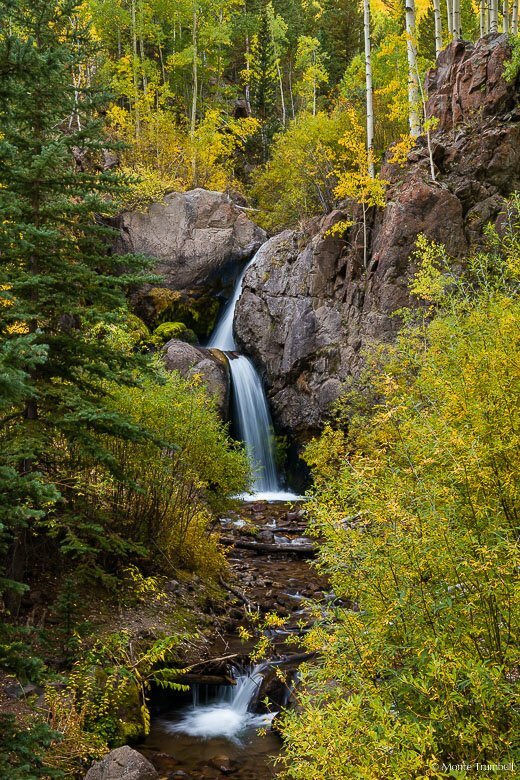 Nellie Creek Falls gracefully steps its way through a forest filled with the golds and greens of early autumn in the Gunnison National Forest outside of Lake City, Colorado. I spent the last couple of days driving around the state checking out fall color conditions. A little out of the way, but high on my list was to visit Lake City in southwestern Colorado. I have only been to this waterfall once before back in 2014 and was anxious to get to another chance to photograph it. I made my way out of Lake City to the narrow four-wheel drive road that passes by the falls and found the parking spot. There was some good color in the aspens and underbrush, but still plenty of green in the aspens up above where I had shot from before. I took a few different shots and packed up. As I walked down the road I noticed a faint trail down along the creek and decided what the heck, why not check it out. The scramble down the hill wasn’t too bad and I made my way back to the falls. From down below I was able to frame up with falls with a beautiful mix of greens and golds, much better than from above. This was my favorite of multiple compositions that I made. I love how the falls are framed by the golden foliage. I figured this was just going to be a scouting trip, but came away with a shot I love. Who knows, I might be back in a couple of weeks to see how it looks again!